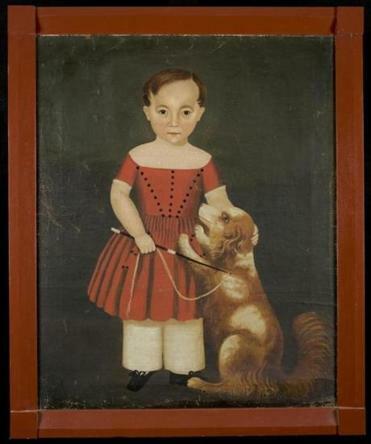 An unknown artist portrayed a serious-looking Edward Hibbard at about age 4 with his dog. WORCESTER — In ads promoting “American Folk Art, Lovingly Collected,” the Worcester Art Museum suggests the show can be seen as a 19th-century version of Facebook. True enough: Much of the exhibition, which spotlights paintings, furniture, and more collected over nearly 60 years by local couple Barbara and Dave Krashes, focuses on how families captured memories in portraits. This singular show is fascinating, peculiar, even unnerving in its depictions of young children. The Krasheses have a soft spot for portraits of children, because they wore brighter colors than adults. Even so, these paintings have a bittersweet quality; life was not easy, and many children did not survive to adulthood. Convention, not sorrow, is why the stern tykes in these paintings rarely smile. They’re nothing like the expressive kids in today’s endless social-media videos. Not a giggle erupts from young Edward Hibbard, portrayed with his peppy spaniel by an unknown artist. Pink-cheeked in a red frock and pantaloons, Edward must be just about 4; he has a high forehead and delicate features, and he carries a riding crop. Let’s hope he didn’t use it on the pup. The children’s portraits disarm on several counts. They’re painted in typical 19th-century-portrait fashion, with a self-seriousness we’re used to seeing in adults — not tots who don’t have the social savvy to maintain such composure. They gaze out at us directly, engaging in an unwitting power dynamic with the viewer. In many cases, they’re painted well, but not expertly — proportions skew, and volume or space flattens. 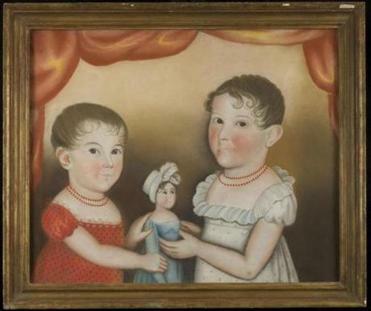 In “Two Children With Doll,” attributed to Deacon Robert Peckham, the artist overuses shadow, yet the two girls pop out of a space as shallow as a puppet show backdrop. “Two Children With Doll” is attributed to Deacon Robert Peckham. Many of these artists worked formulaically; many were quite talented. Yet even some of the least skilled among them presaged modernism, with its compressed spaces, contorted figuration, and attention to surface and flatness. Early modernist sculptor Robert Laurent once collected “Girl in White With Cat,” attributed to Zedekiah Belknap, making it one of the first folk-art portraits collected as art. Now it’s in the Krasheses’ collection. You can see how a modernist would be attracted to it: The shapes of the girl’s ballooning sleeves and skirt, the clean planes of her face, the blunt lines of the settee upon which she sits, all describe simple forms — the building blocks of abstraction. Then, the cat she holds looks part marmoset, and its eyes gleam more than hers do — strangely riveting technical misfires. Many of these works were made locally, and they tell us a great deal about life in 19th-century Massachusetts. A rising middle class spurred on by industrialization could afford a few dollars to pay itinerant portraitists to capture children’s likenesses. No John Singleton Copleys here — these painters were untrained. But like Copley, they adorned their subjects with whatever symbols of status came to hand, even if that simply meant sitters wearing their Sunday best. Because their subjects were not wealthy, painters such as William Matthew Prior didn’t command lofty fees for their work. Marketing strategies came into play. Prior came up with a price scale, asking less than $3 for smaller works with no shadowing made in less than an hour, and $25-$30 for more time-consuming pieces. One of Prior’s bargain paintings fluidly depicts wee Eliza C. Allen, the 2½-year-old daughter of a laborer, beribboned and holding a tiny purse. His more elaborate “Child With Whip” elegantly captures a little boy in a dress and pantaloons. Rosy as the little fellow is, I can picture his placid, self-satisfied expression on the middle-aged man he will become. Other works provide context for the portraits. A painting hung over the mantel in the late 18th-century house of Reverend Joseph Wheeler captures an expanding Worcester with Wheeler’s manse to one side. It, too, has an eerie modernist edge: The trees fall into a pattern, as do the clouds in a sky strangely vast for such a horizontal painting. The blanket chests are magnificent; one attributed to Nehemiah Randall has intricate fan carvings. Another, made by an inventive unidentified artist, was painted, brushed with a glaze made of vinegar or sour beer, and rolled over with an oil-based putty to create a strikingly mottled surface, with striations and radiating patterns. An astonishing needlework piece, “Memorial for Polly Warren,” embroidered by Polly’s daughter, teenager Mary Chapin Warren, depicts a young family bereft at a prominent gravestone beneath a weeping willow. Despite the predictability of the Dickensian image, the piece is made with exquisite care, every stitch freighted with loss. Finally: a pincushion. Certainly, one of the reasons “American Folk Art, Lovingly Collected” is so magnetically odd is two centuries’ gulf of understanding. When I picture a 19th-century pincushion, I imagine a girl’s dutiful needlework; I imagine a satiny pillow, intricately stitched, perhaps embroidered with a sentiment. As this one is: “Infancy and Innocence,” it reads. What I hadn’t pictured was the pins protruding in precise clusters from the letters, the floral motif, and the border. Infancy and innocence bristle; they look nearly lethal. Childhood now is not what it was then. Familial and economic exigencies often put children to work early; the vestiges of a Puritanical ethos in New England discouraged idleness. As portraits and fineries do, these works speak to social standing, not life’s hard realities. Still. Those hardships seep in. Worcester Art Museum through Nov. 29.